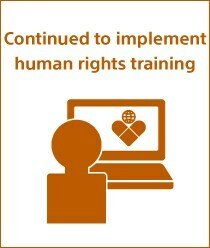 In recent years, interest in the impact businesses may have on human rights has been growing internationally. As an enterprise that operates globally, the Sony Group recognizes its responsibility to respect the human rights of all stakeholders involved in its business operations, including employees and suppliers, and to ensure labor practices are appropriate. Following its basic policy to respect human rights, which is set forth in the Sony Group Code of Conduct, Sony expects all group companies to pursue responsible business conduct by complying with relevant laws and regulations and respecting all human rights. Sony strives to respect human rights in all of its business operations in accordance with the Guiding Principles for Business and Human Rights issued by the United Nations Human Rights Council. The CSR Section at Sony headquarters, which is supervised by the Corporate Executive Officer in Charge of CSR, assesses and monitors human rights risks throughout Sony Group’s business activities and supply chains. The human rights of employees are addressed by a diversity committee at each Sony Group company in Japan. These committees conduct workshops on human rights and diversity. Sony has also established systems and mechanisms for employees seeking consultation on human rights issues and risks in order to ensure a quick response when problems arise. Became a member of the Partnership on AI to Benefit People and Society, a non-profit established to facilitate understanding of AI technologies and related ethical issues, in order to address problems facing humanity. Sony is committed to making reasonable efforts to avoid causing or contributing to adverse human rights impacts that may arise from our operations, products, services and/or business relationships.